Last weekend when my grandsons came for a visit, the 12 year old showed me a photo on his phone that he (somehow!) 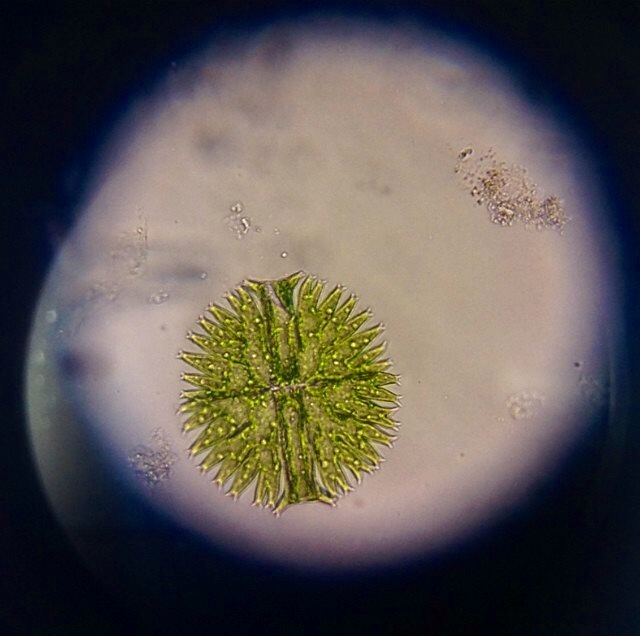 took though the microscope in his science class. The new and special wonder of observing the very clear “thing” that lives in a world much smaller than we can possibly see had him entranced. The surprise of the color, the amazing detail with its hairy-looking texture, the seemingly improbable spherical form — all added up to a phenomenon that could hold his interest in science going forward. We are all attracted to the surprising and new, and often children bring home what seems like carloads of questions and observations that need immediate responses. But if parents put on “detective glasses” and look at what a child is seeing, making, and doing like a scientist collecting “data,” over time patterns will emerge that signal the individual contours of the child’s unique brand of imagination, which is the combustion engine of the intellect. Using the Sensory Alphabet as a lens is a good way to notice these patterns. Is she attracted to color and texture? Always needing to be “hands on?” Does he need to literally “move” though a situation to get a feeling for it, understand it? Does she need to watch from afar? What does he collect on his own? What are her pockets full of? How is free time away from screens spent? What holds interest? What exactly is he curious about? What we know from our research over decades of observing is that these patterns of perception and action don’t change over time and can be an important guide to discovering satisfying fields of study and eventual careers. Children don’t notice these patterns themselves, of course. Parents are the ones who can best sift through that ongoing stream of anecdotal consciousness that is the work/play of growing children. What is important is for parents to know that they are discerning extremely valuable information about their child. It may not match up to test scores at school and it may rely on “visual information.” It inhabits that interior world of “knowings:” of resonance, intuition and inspiration. But it is the best predictor of what a child will want to get good at, to have patience for—even determination—all qualities that will serve our children best as they lean into an unknown future.